The ProBasket Elite is made of high quality materials with the goal of making it both functional, long lasting and beautiful. 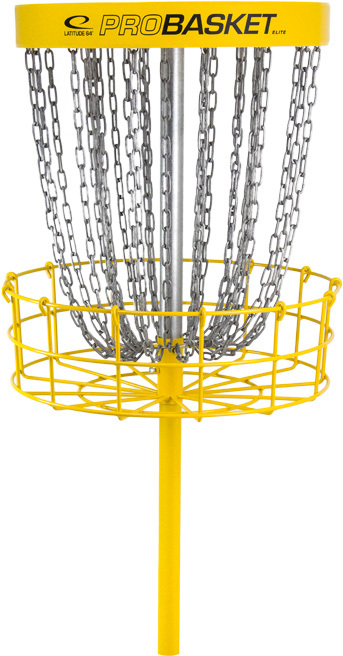 The pole and chains are galvanized, and the lower pole, basket and top have a powder coat finish get optimal protection and to make it what is arguably the best looking Disc Golf target out there. The double chain set consists of 14 inner and 14 outer chains which gives it a “softer edge”, and increases the chance for discs to “stick” to the chains. This also ensures that putts don’t slip through the chains, and likewise hitting the pole causing frustrating ”spit outs”. The yellow 4” tall deflector band on the top rim improves visibility in all conditions, and the chain sliders on the inside steers the chains in a zig zag pattern which also makes the basket even less sensitive to ”spit outs”. Tension screws are included for increased stability and the splitable pole and welded nuts makes for easier assembly. 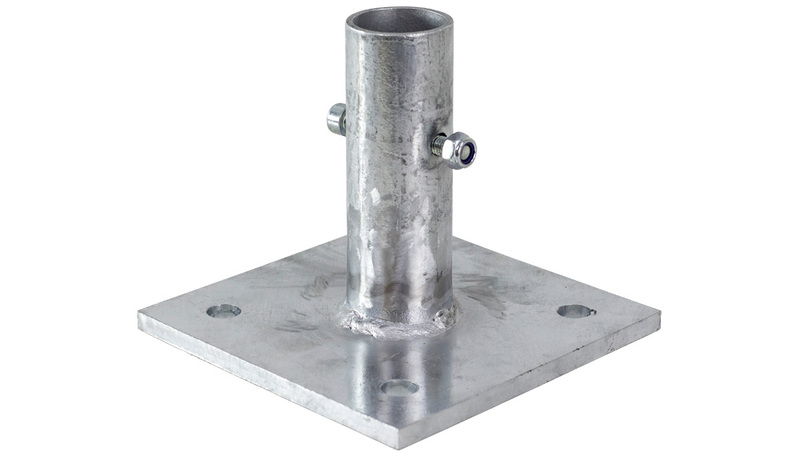 The Top Adapter (1) is an option that is mounted at the top of the basket tube, and is used for attaching accessories for better basket visibility. The number plate (2) is used for displaying hole numbers, to ease course navigation. The small tube attachment (3) allows a flag to be placed on top, to make the basket placement more visible in hilly terrains. For courses with varying green placements. A sturdy design with a built in wheel which makes it easy to move. 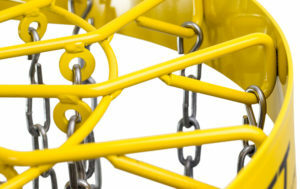 Just as the baskets it has a zink foundation under a powder coated surface. This is the foot for the permanent course. You simply dig a hole deep enough and secure a concrete foundation. Then insert the basket and you are good to go. 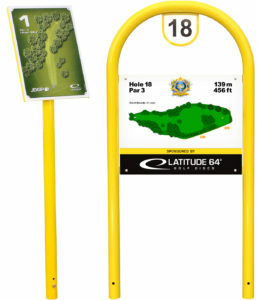 Can be used for baskets, info boards and tee signs. For stony landscapes where digging a hole is not an option. This foot allows you to drill and mount the basket into the rock. Can be used for baskets, info Boards and tee signs. The Tee Sign Small and it’s sturdy design has been around for many years without the need of alteration. The actual sign is 28 x 40 cm and the total height, including the pole, is 124 cm. The metal is treated with a zink foundation before the powder coating to protect it from corrosion. If you want to spoil your course (and the players on it), we suggest you choose the Tee Sign Large. Consisting of a 48,3 mm curved pipe and a sign plate of 40,6 x 50,8 cm, this sign stands 122 cm high. The metal is treated with a zink foundation before the powder coating to protect it from corrosion. The info board is usually the first thing you will see when you come to the start of a Disc Golf course. 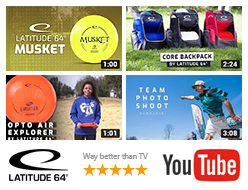 It will give you a good overview of the course and it’s surroundings, as well as the basic rules of the game. Many courses bring in sponsors to help finance the course and will display the sponsor logos on this board for all to see. • E-zink galvanized with a powder coat finish. • Two sizes available; Standard and Large (example below). • Standard: Width 117 cm, Height 220 cm. Sign 105 x 70 cm. • Large: Width 197 cm, Height 277 cm. Sign 186 x 115 cm.